101 Federal Street is a skyscraper on Federal Street in the Financial District neighborhood of Boston, Massachusetts. Completed in 1988, the 116 meter (381 ft) building was designed by Kohn Pedersen Fox Associates PC. The building is also known as 75 - 101 Federal Street These buildings contain 800,000 sq ft (74,000 m) of office space. The State Street Trust Building is the 75 Federal Street portion of the building. The Art Deco building was designed by Thomas M. James in 1929.. The Amoco Building, located at 1340 Poydras Street in the Central Business District of New Orleans, Louisiana, is a 21-story, 280 feet (85 m)-tall skyscraper designed in the international style by 3D/International. The building is primarily used for leaseable office space, with some retail space on the ground level. The design of the building can be best classified as international with its black aluminum and glass curtain wall. Chevron Place, located at 935 Gravier Street in the Central Business District of New Orleans, Louisiana, is a 21-story, 238 feet (73 m)-tall skyscraper designed in the international style by Stanley Muller & Associates. The building is primarily used for leaseable office space. The Chicago Temple Building is a 173 meter (568 foot) tall skyscraper church located at 77 W. Washington St. in Chicago, Illinois, United States. It is home to the congregation of the First United Methodist Church of Chicago. It was completed in 1924 and has 23 floors dedicated to religious and office use. It is the tallest church building in the World, though not the tallest church in the world (see Ulm Cathedral). It was designed by Holabird & Roche. The City Hall Square Building was a 79 meter (259 ft) tall building located on North Clark Street in Chicago, Illinois, United States. It was completed in 1912 however was destroyed and replaced in 1965 by the Richard J. Daley Center. 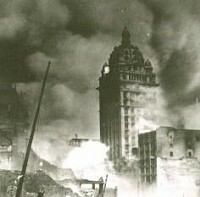 It had 21 floors and was located opposite Chicago City Hall. When in use, it was an office building built in the classical style. Ornamental stone cladding was used for the upper faςade and the lower 4 floors while the mid-faςade was brick. 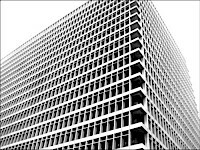 The Clara Shortridge Foltz Criminal Justice Center (formerly known as the Criminal Courts Building) is the county courthouse in downtown Los Angeles, California, U.S.A. It is located at 210 West Temple Street, between Broadway and Spring Street. Originally known as the Criminal Courts Building, in 2002 it was renamed the Clara Shortridge Foltz Criminal Justice Center, after Clara S. Foltz, the first female lawyer on the west coast of the United States. 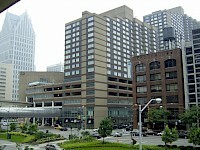 The Courtyard by Marriott is a mid-upscale high-rise Hotel in downtown Detroit, Michigan. It stands next to the similarly-appearing Millender Center Apartments, and is connected to the apartments, the Renaissance Center, Millender Center Detroit People Mover station and the Coleman A. Young Municipal Center via an enclosed Skyway. The building stands at 333 East Jefferson Avenue. It was built in 1984 and opened in 1985 as the Omni International Hotel.